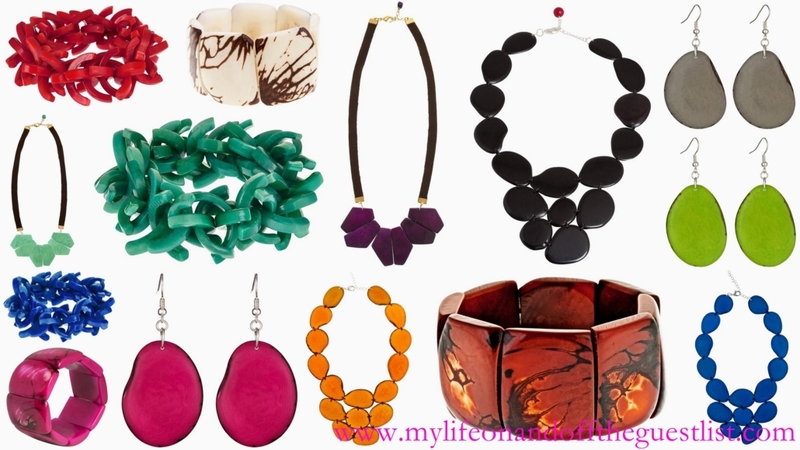 The gifting season is almost upon us and we all know one gift that’s always a hit for the ladies – jewelry!! 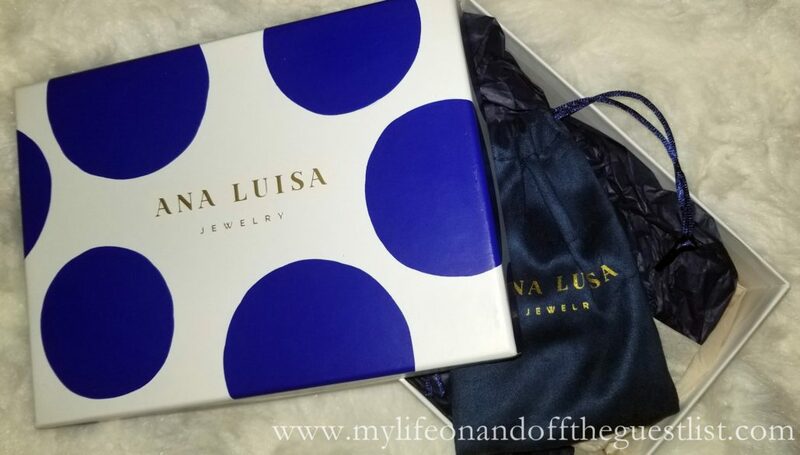 What’s better than giving the great gift of jewelry? Saving on those holiday jewelry gifts. We’re happy to once again share the upcoming PONO 2018 Holiday Jewelry Sample Sale. 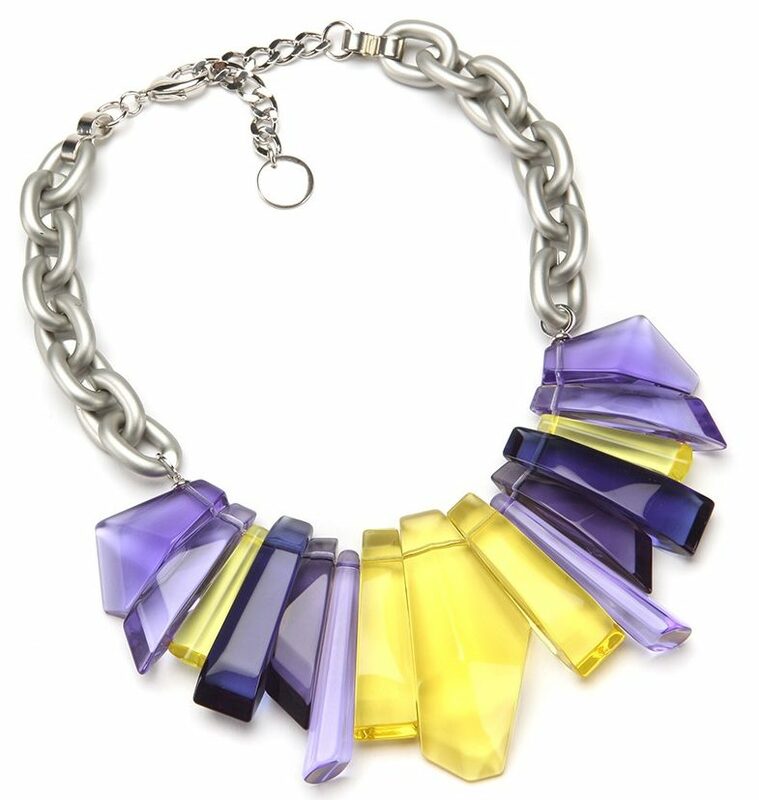 As you know, we are obsessed with the stunning Italian Resin jewelry (which you may remember Rihanna rocked in the June 2018 issue of Vogue). 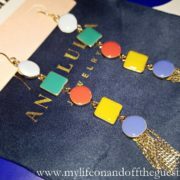 Well, here’s your chance to score some of the gorgeous PONO jewelry at wonderful sample sale prices. Get gorgeous gifts galore with a stop into the PONO 2018 Holiday Jewelry Sample Sale where the bold and beautiful baubles are all 50-80% off. 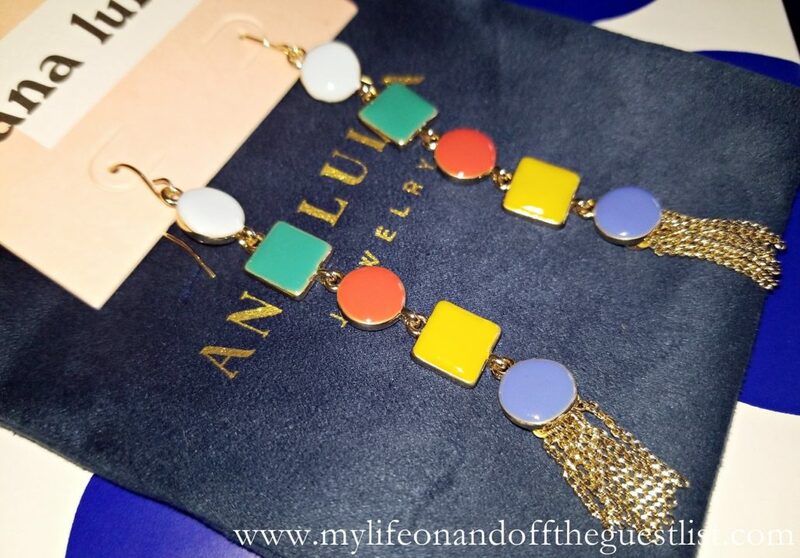 Shop and save to your heart’s content while you meet PONO’s Creative Director, Joan Goodman and feast your eyes on gorgeous goods from $5.00 – $500.00. 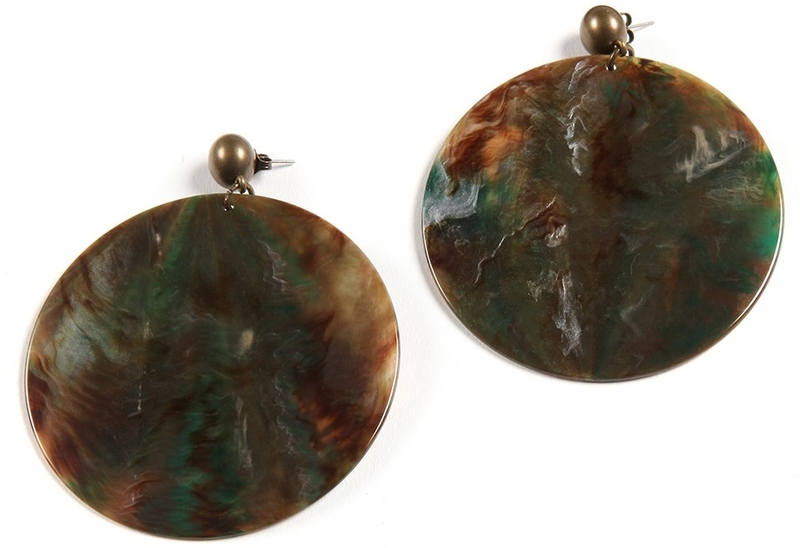 Go big with a posh pair of oversized Moon Resin Earrings – once $100 and now all yours at a fantastic $55.00. 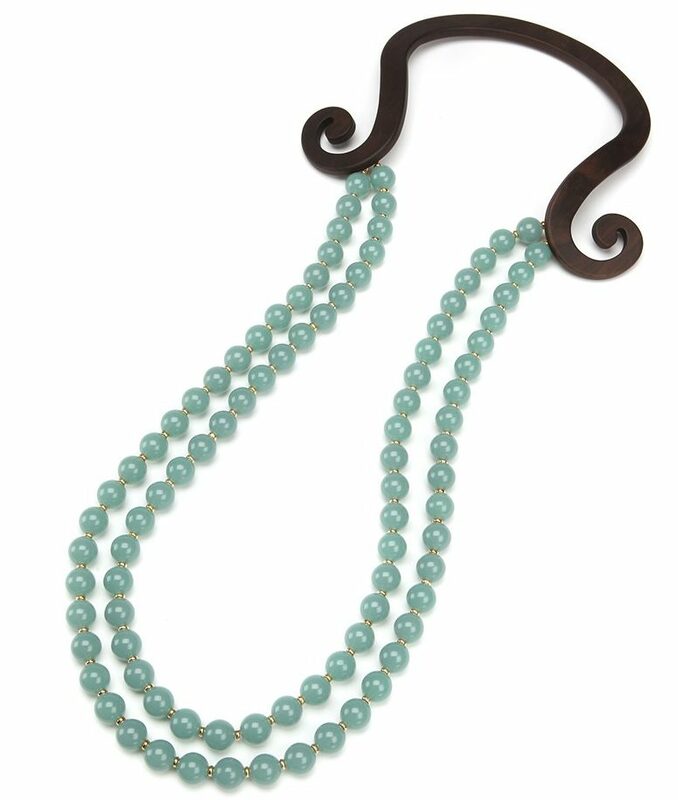 Score the sensational hand-sculpted, beaded Italian resin Allegra Necklace, previously $600.00 – now available at an amazing $250.00. Steal the crystal-clear multilevel geometric Sea Glass Necklace for $175.00 down from a former $415.00, or own the Angle Bangle, a fusion of poetry and geometry – regularly $65.00, now yours for only $25.00. For the finish, indulge your wrists at the bangle bar, where 3 pieces are yours for only $25.00, 5 go for $30.00, and 10 can be taken for $50.00. All bangles are originally valued at $30.00 – $45.00 each. 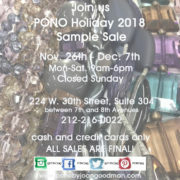 How do you get to the PONO 2018 Holiday Jewelry Sample Sale? Head over to 224 W 30th St., Suite 304, between Seventh and Eighth Aves. Hop on the following subways: B, D, F, M, N, Q, R to Herald Square, or the 1, 2, 3, A, C, E to Penn Station. The sample sale runs from Monday, Nov 26th through Friday, Dec 7th, from 9am–6pm. Please note the location is closed on Sundays. For more information on PONO and the upcoming sample sale, call (212-216 0022). 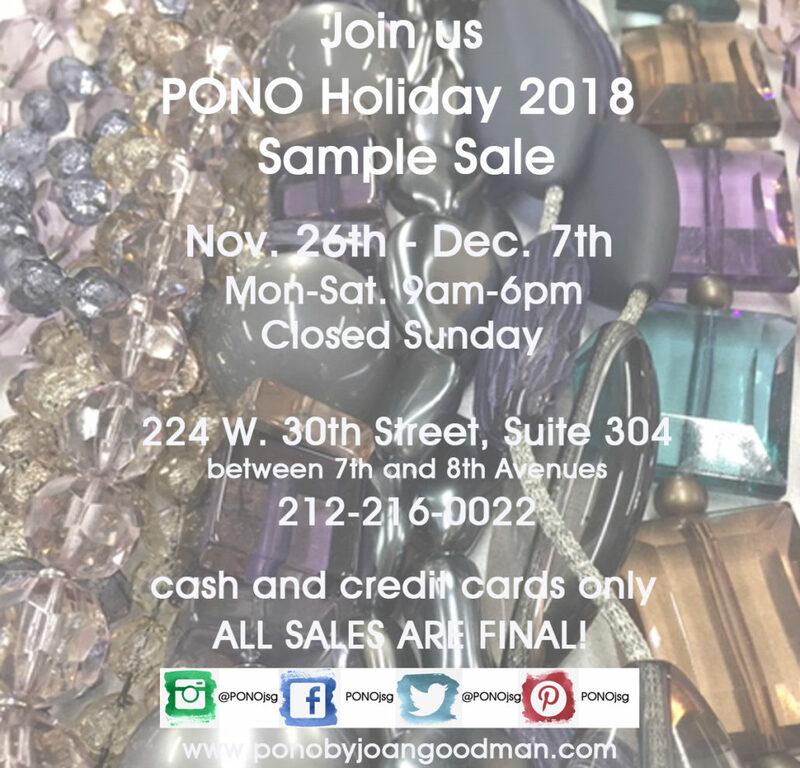 What are you looking forward to buying at the PONO 2018 Holiday Jewelry Sample Sale? Almost four years ago, while attending an Accessories Council holiday gift ideas event, we were first introduced to Mujus Jewelry, a stunning handcrafted jewelry brand with sustainable connections. We were so captivated by these gorgeous jewelry pieces, we highlighted their eco-friendly jewelry again the following year. That was too long ago, so we’re back to share some more of our favorite pieces from Mujus Jewelry and offer you, dear readers the CHANCE TO WIN a piece from the jewelry brand that empowers women. Mujus Jewelry pieces are handcrafted in Ecuador by artisan women who are either single mothers or heads of household. 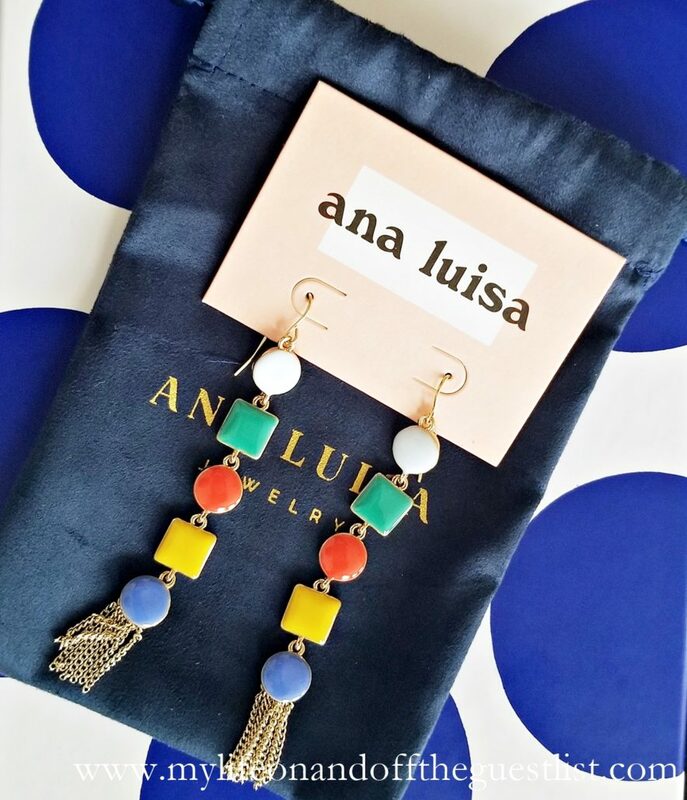 Mujus Jewelry Founder, Paola Delgado created the brand to reconnect with her culture and create a more meaningful life for both the women in Ecuador and for herself. By making these beautiful pieces, these women gain financial independence, strength, and an amazing sense of self. Mujus Jewelry’s Working Mother’s Program not only teaches these women the art of jewelry making, it allows them to work from home to spend more time with their families. 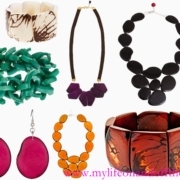 As we’ve mentioned before, the jewelry pieces are carved from Corozo Nuts, seeds from the South America tagua palm tree that are known as vegetable ivory. It is incredibly durable and lightweight and boasts the same luxurious smooth texture as ivory, giving you the same luxury without having to harm any Elephants. Doesn’t that sound like a must-have for your jewelry box? Well, here’s your chance to win. 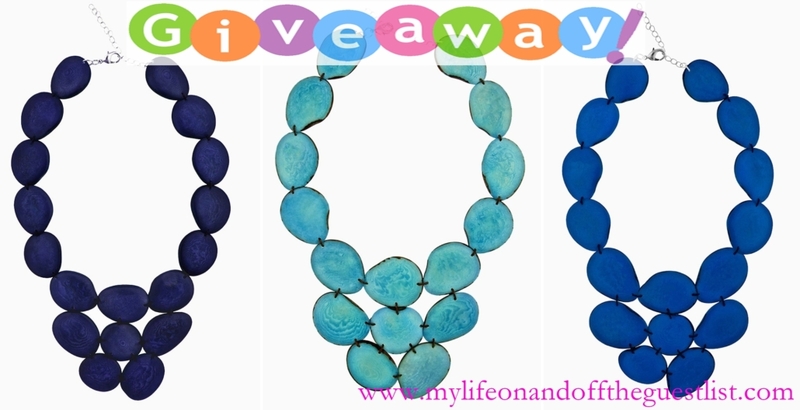 We are happy to offer you the opportunity to win one of our favorite pieces from the collection, the Gema Bib Necklace ($69.00), in one of the following colors – Monaco Blue, Teal, and Yves Blue. While attending an event during the winter season, we spied one of the event’s attendees with a clutch so fabulous, we had to stop her and inquire. We found out that fabulous holiday designed clutch (it was accented with working small c7 Christmas lights) is from Kent Stetson Handbags. Although it took some time, we’re happy to bring you more of the stunning collection from the fun, whimsical, and extraordinary handbag label. It will come as no surprise that Kent Stetson’s background is in art. His signature asymmetrical and non-asymmetrical clutches (they all come with a handy crossbody strap), and larger day bags are fun conversation pieces. 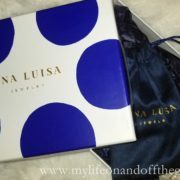 As we previously stated, the clutch we saw was so eye-catching, we were compelled to find out more about it. The Kent Stenton Handbags has a wonderful variety of design options made from luxury-quality coated canvas, and we wish we could highlight them all but this would end up being extremely long. We are, however, sharing our favorites with you today. 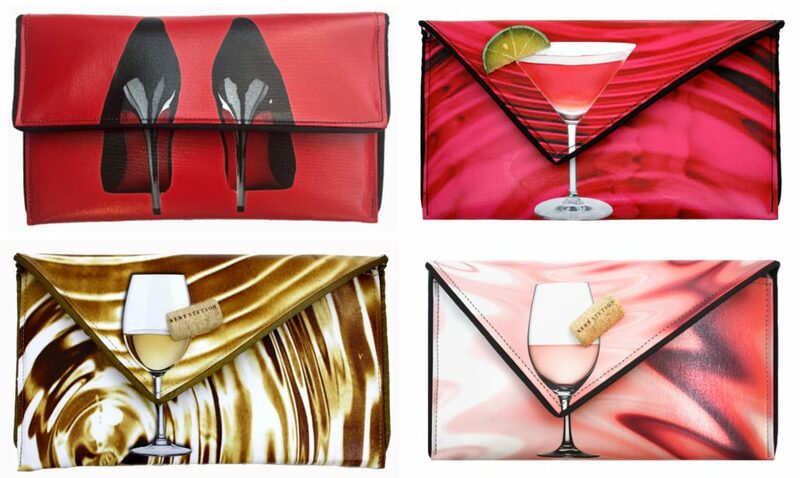 The shoe addict and those who love adult beverages will love the following clutches, the Heels Clutch ($208.00), Cosmopolitan Clutch ($205.00), Rosé Clutch ($205.00), and the White Wine Clutch ($205.00). 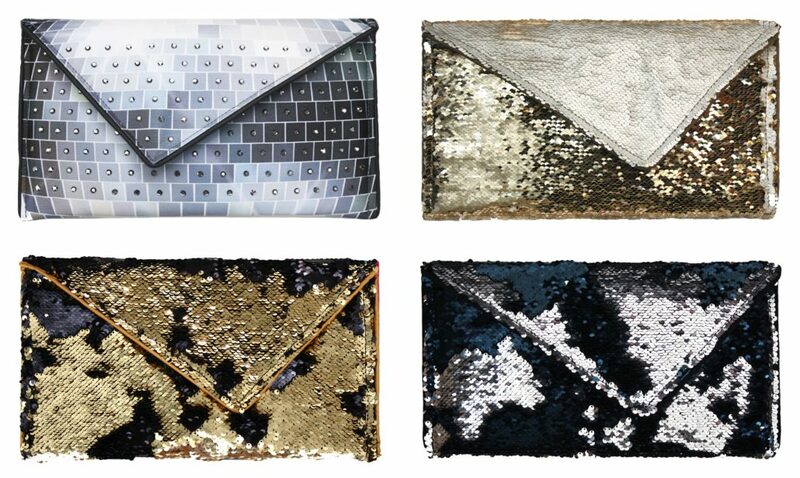 For you metal heads, and by that, we mean metallic fashion; you’ll love the following rich metallic and textured styles: the Disco Ball Clutch ($298.00), Ivory & Gold Paillette ($198.00), Gold Paillette Clutch ($198.00), and the Silver Paillette Clutch ($198.00). 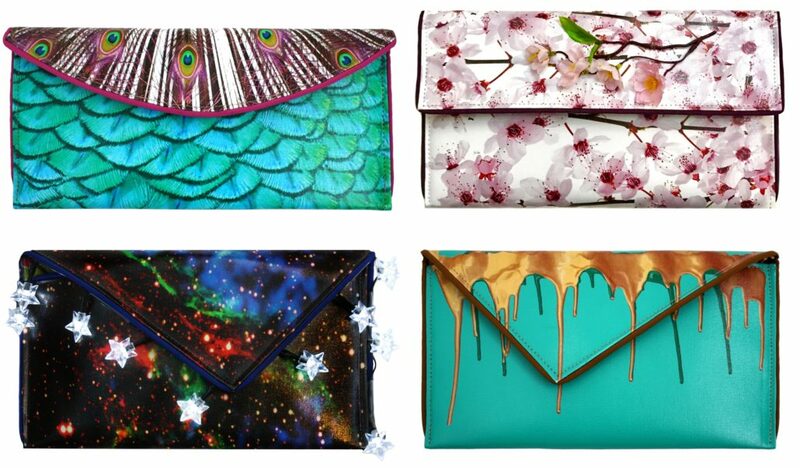 For those looking for bold and memorable color and prints, you’ll love the Peacock Clutch ($198.00), Cherry Blossom Clutch ($212.00), Celestial Clutch ($208.00) – complete with battery powered lights, and the Dripping in Gold Clutch ($198.00). 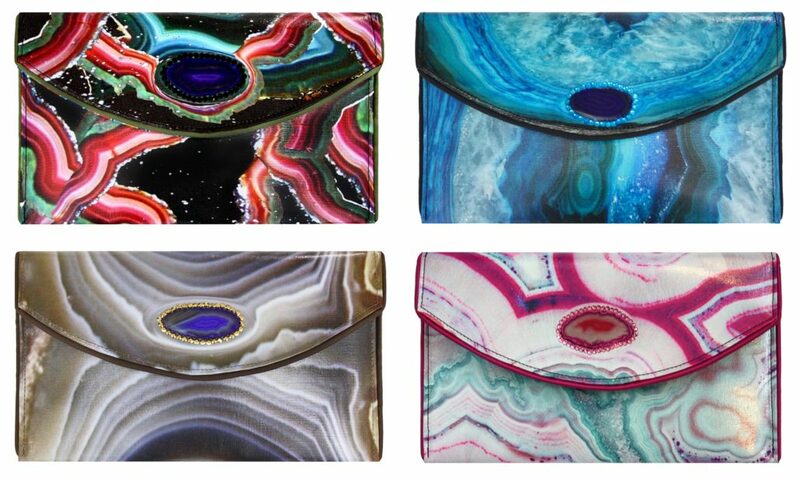 Last but certainly not least, for those of who loves the natural beauty of geodes, the Kent Stetson clutches featured above are perfect for you, most of which are accented in crystals and agate. Going clockwise, we have the Black Geode Clutch ($230.00), Aqua Geode Clutch ($230.00), Topaz Geode Clutch ($230.00), and the Tropical Geode Clutch ($230.00). All Kent Stetson handbags come with a removable cross-body chain, logo dust bag, clear vinyl inner pocket, and are individually signed by the designer artist himself. So there you have it, your new bag obsession. 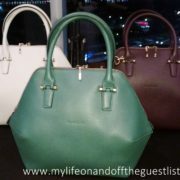 To get to know more about Kent Stetson and their amazing collection of bags, visit www.kentstetson.com. 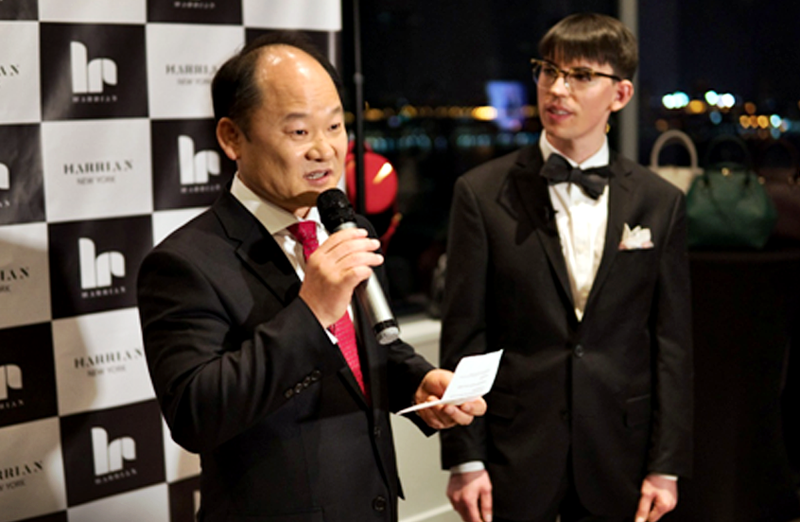 Multiple Independent Designer Awards winner, Christopher Belt has teamed up with Seoul, Korea Handbag brand Harrian to launch a new affordable luxury handbag collection and we had the pleasure of attending the launch event. The Christopher Belt and Harrian New York handbag line features a collection of mid-tier to high-end handbags created with inspiration from the world of architecture, furniture, and fashion. Handbag designer Christopher Belt is a fan of angular lines and details that are prevalent throughout the collection. What started out as a small Manhattan boutique in 2014 is primed to become one of the most sought-after ranges of handbags. Each item in the Christopher Belt and Harrian New York handbag line is carefully created to reflect wit, elegance, and style while maintaining a “go anywhere” functionality. Chic and street-sensible, the Christopher Belt and Harrian New York handbag collection features something that will appeal to virtually every woman. Every handbag from the Christopher Belt and Harrian New York handbag collection is beautiful but we do have our ultimate favorite styles. Top design choice for us is the hexagon shaped Galeforce Tote (the first handbag pictured). The minimal style handbag features short handles and a long shoulder strap in a two-way style that screams luxury. 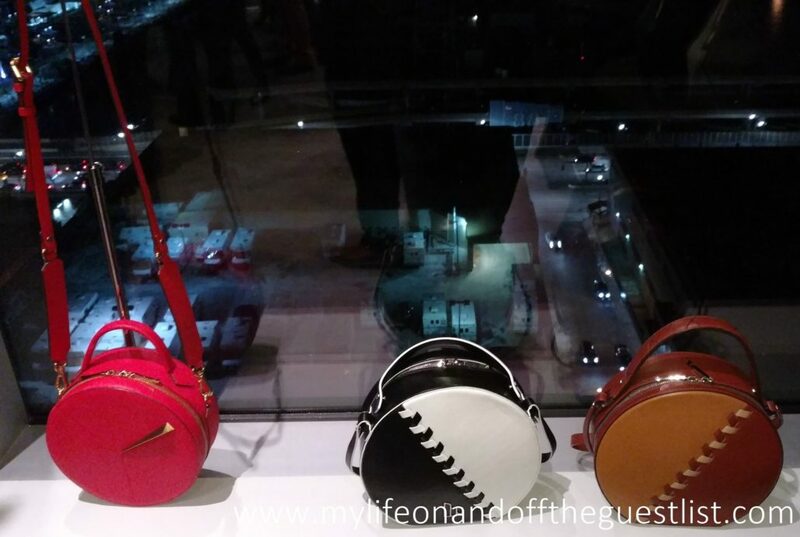 The circular Ticktock Crossbody (featured below in red) is inspired by the concept of time. The bag features Hermes embossed leather in a trendy circular shape with a triangular bar decoration to represent the hand of the clock, a short handle, and a removable long shoulder strap. The chic Cherry Bomb Retro Mini Cross Back boasts imported Italian leather, is decorated with gold cherries all over the front, and features an adjustable shoulder strap. 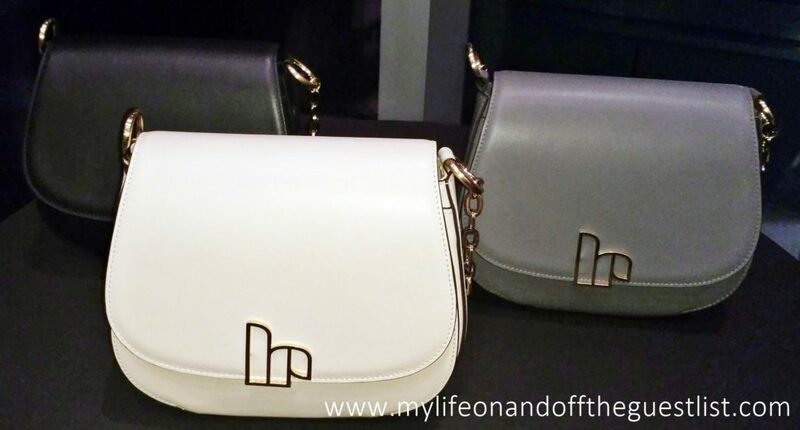 For those who love classic and minimal styles handbags and purses, styles like the rectangular shaped Empire, the rounded bottom Velocity, and trapezoid-shaped Scamper bags are perfect fits for your sophisticated and timeless tastes. 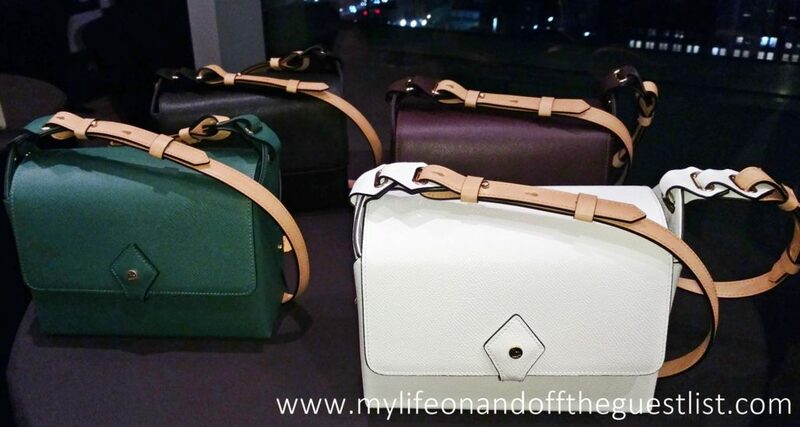 We love these stunning bags and look forward to seeing more from Christopher Belt and Harrian New York. 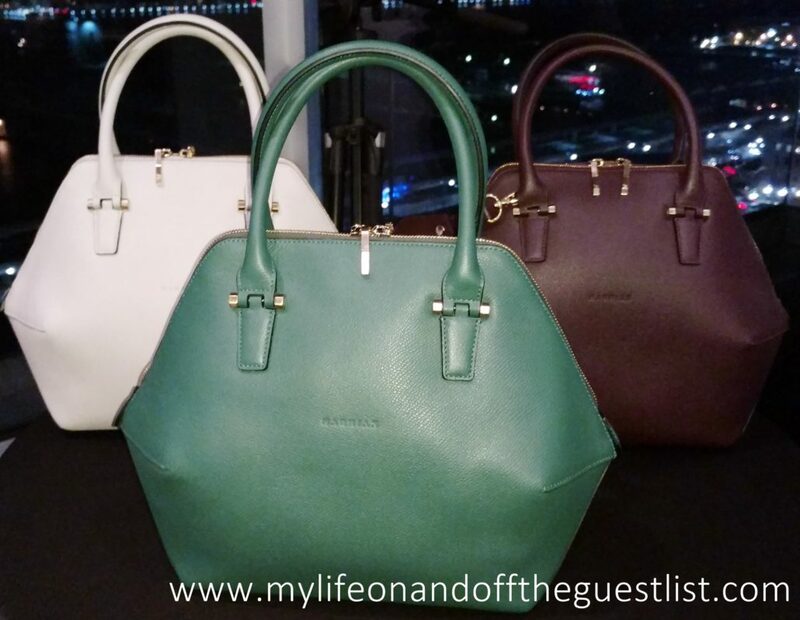 What are your thoughts on this new handbag line? Which styles are your favorites? Hello and happy Friday fellow fashionistas. We’ve got some amazing accessory news to share in honor of London Fashion week. 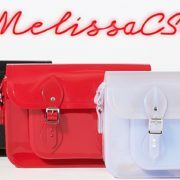 One of our favorite footwear brands, Brazilian plastic footwear brand, Melissa, has announced an exciting new collaboration with iconic British handbag and accessories brand, The Cambridge Satchel Company. Officially launched today, the first day of London Fashion Week, Melissa and The Cambridge Satchel Company welcome the Melissa X CSC Satchel Collection. The contemporary capsule collection of bags features Cambridge’s classic 11″ satchel, in Melissa’s signature Melflex plastic, giving CSC cutomers a vegan alternative. The Melissa X CSC Collection is the perfect blending of British heritage and Melissa’s innovative and stylish designs, giving the bags both a modern and timeless feel. The re-envisioned Melissa The Cambridge Satchel Company 11-inch satchels feature classic buckle closures, detailed stitching, easy-to-open pin closures, an adjustable strap, and nickel-free metal hardware with authentic “Cambridge” branding. 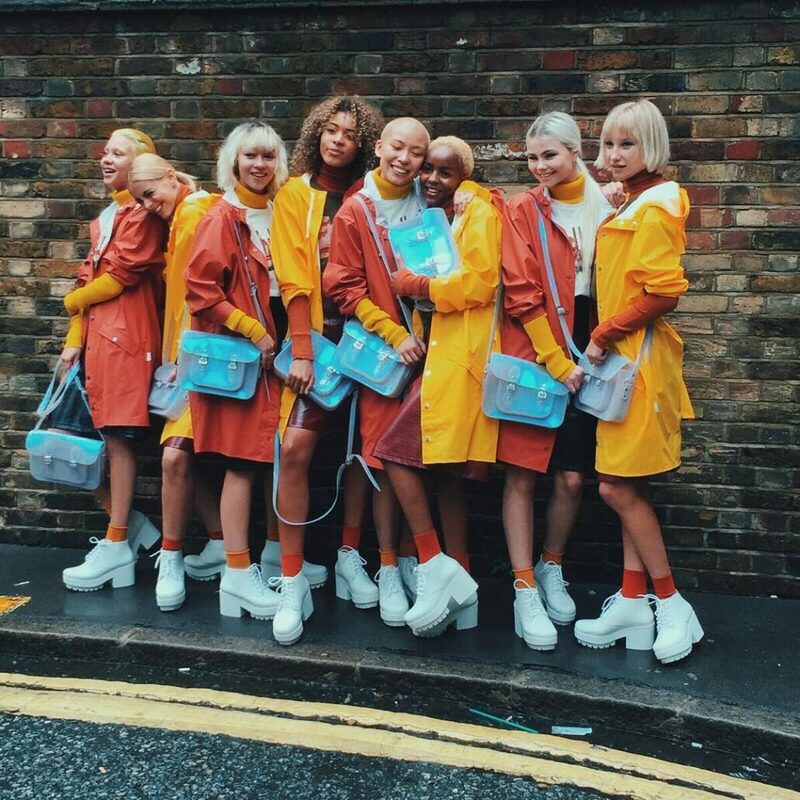 The bags boast a glossy finish, a delectable bubblegum scent, and is entirely waterproof, perfect for London, who averages around fifteen rainy days a month. Production for the Melissa X CSC Collection was moved to Melissa’s manufacturing facilities in Brazil specifically for the collaboration (The Cambridge Satchel Company bags are traditionally handmade in England). The stylish Melissa X CSC Collection bags are offered in three distinct colorways: Black, Red, and limited edition color, Holographic. The Melissa X CSC Collection satchels are available now for purchase at Galeria Melissa London and The Cambridge Satchel Company flagship for €135.00 ($155.00 USD). The Cambridge Satchel Company joins an impressive repertoire of top-caliber designers who have collaborated with Melissa, including Karl Lagerfeld, Vivienne Westwood, Jean Paul Gaultier, Zaha Hadid, and many more. Are you loving these bags as much as we are? What are your thoughts on the Melissa X CSC Collection bags? Are you excited for this collaboration? Share your thoughts in the comments. We all know that helping others in need leaves you filled with a wonderful feeling, and who wouldn’t want to experience that feeling. Wouldn’t you love to know that the gift you give to mom this Mother’s Day is also helping others? 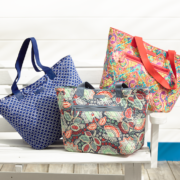 This Mother’s Day, Vera Bradley introduces a special limited edition Vera Bradley for Win Reversible Tote, that supports a great NYC-based charity organization that hopes to break the cycle of homelessness for women. 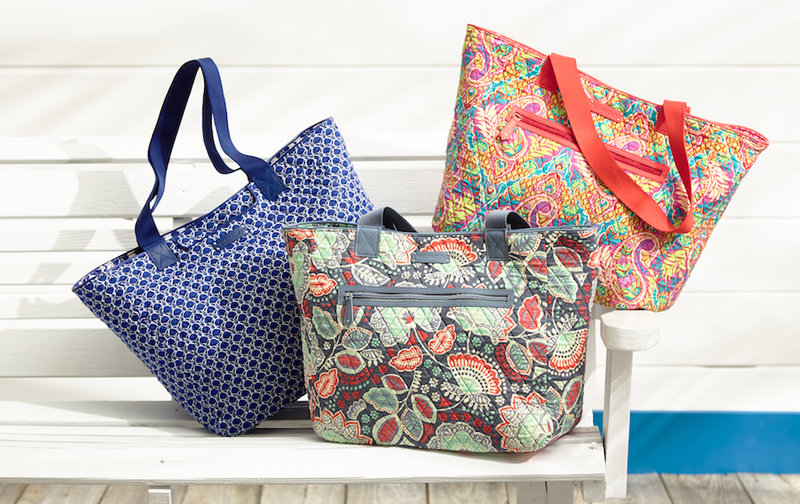 The limited edition Vera Bradley for Win Reversible Tote is available in three colors/prints including Cobalt Tile, Paisley in Paradise and Nomadic Floral. These three great totes were created in partnership with Macy’s to support Win, Women in Need, a NYC-based charity that transforms the lives of homeless women and their children by providing safe housing, holistic services, and innovative programs to break the cycle of homelessness. Just in time for Mother’s Day, the limited edition Vera Bradley for Win Mother’s Day Reversible Tote is a great way to tell your mom, daughter, sister, friend, etc how much you love and appreciate them, while also helping to give a very Happy Mother’s Day to those moms who need it most. Through the sale of these three limited edition totes, Vera Bradley has committed to donating a set amount directly to Win to help stop homelessness in NYC. The bag is already a hit with celebrities as Gossip Girl alum and mother of two, Kelly Rutherford was spotted carrying the limited edition Vera Bradley for Win Reversible Mother’s Day Tote in Nomadic Floral while flower shopping on Madison Avenue. This is a great way to celebrate giving and shopping for a great cause, and once these beautiful prints are gone, they are gone. 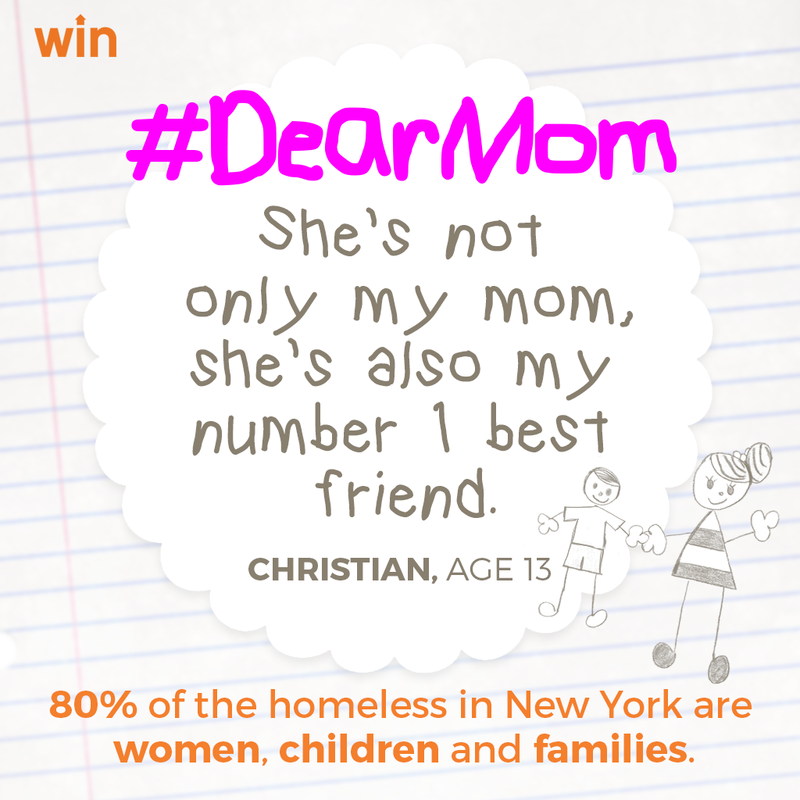 Another wonderful way to support the Win organization is through their Dear Mom campaign. 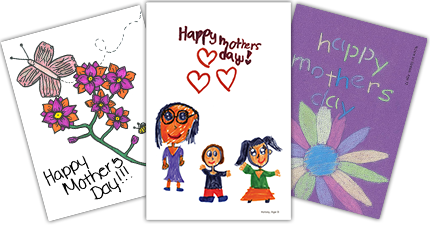 You can send words of encouragement to moms at Win using the #DearMom hashtag and/or send your loved ones a Mother’s Day card, designed by a child living in a Win shelter when you make a $25.00 donation. The chic totes retail for $88.00 each and are available on Macys.com, as well as in 40 Macy’s New York Metro locations, on VeraBradley.com, and select Vera Bradley stores, with all proceeds benefiting Win, Women in Need.